I wrote this post up over a year ago for a guest post on Tatertots and Jello and just realized that I never reposted it here. 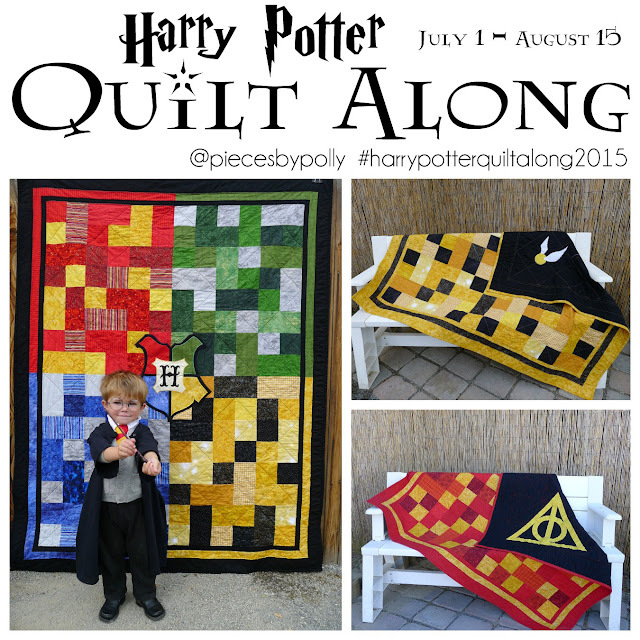 I wanted to link to it...and the old pattern link doesn't work anymore, so I thought I'd post it again here. 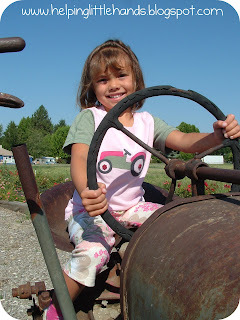 We're moving soon We moved a year and a half ago to a very rural farming town in central Washington for Hubby's new teaching job, and I thought some tractor shirts inspired by a vintage tractor from my Granddad would be a fun celebration. Of course, our daughter needed her own girly version of Granddad's Tractor too...after all she has told us she wants to be a tractors driver (as well as about 10 other things) when she grows up. Both kids were thrilled with them (even though not all the pictures would make you think that...he was anxious to get to the park)! 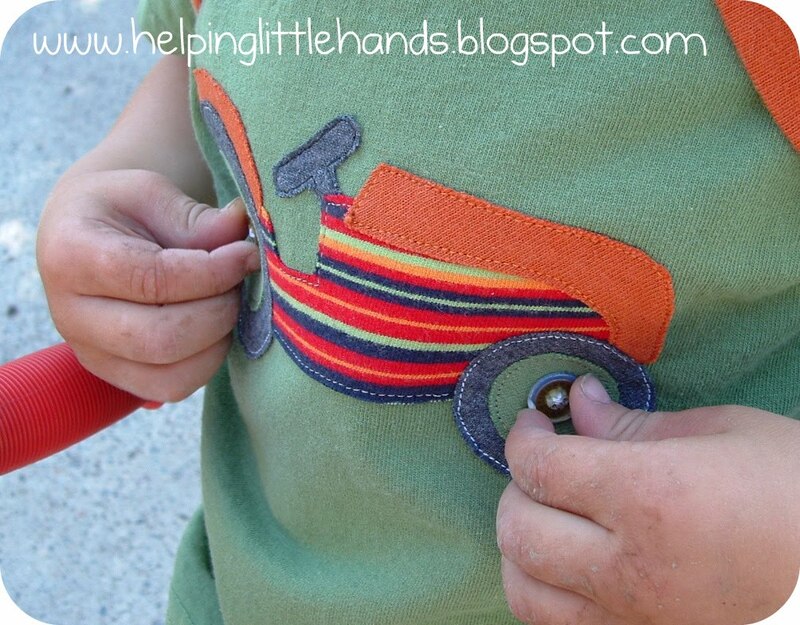 My son loves to play with the buttons on his shirt to make the tractor "drive." This technique will work for any design. Simple clip art or coloring pages are great starting places for designing your own appliques as well. 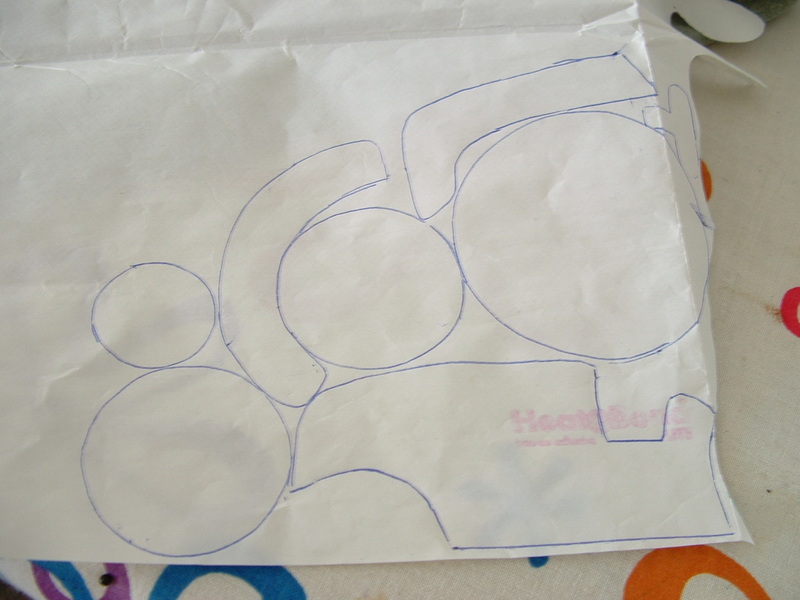 For this project, I simply took a photograph of Granddad's tractor and simplified and traced the picture onto a piece of paper. 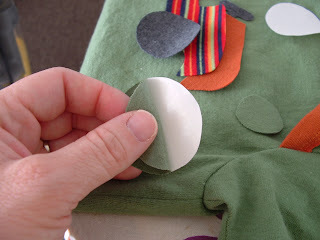 Iron your pieces onto your fabric scraps, and cut them out again. Also don't be afraid to try different combinations. There have been a lot of times, a combination just didn't quite work, and I cut some new Heat'n Bond so I could use a different fabric. 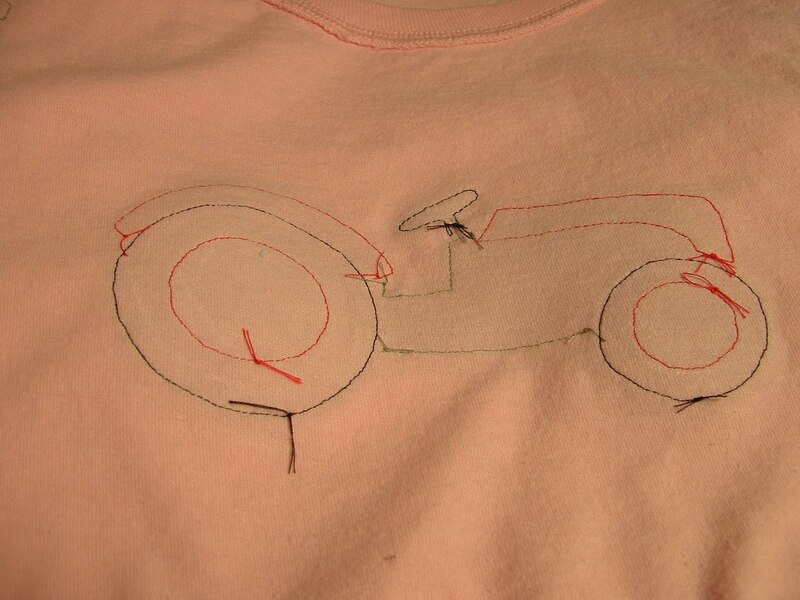 Arrange your pieces onto your T-shirt. Make sure any adjacent pieces are overlapped. I highly recommend measuring to make sure it's centered. There have been times when I've skipped measuring, only to notice it is off center once I had finished. Iron well. Then iron well again. Then iron the backside from inside the shirt. 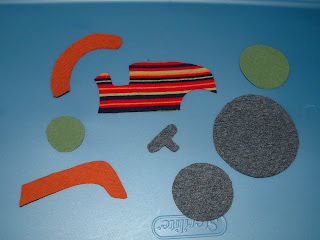 Then check all the edges to make sure they're stuck down and iron any places that are a bit loose. 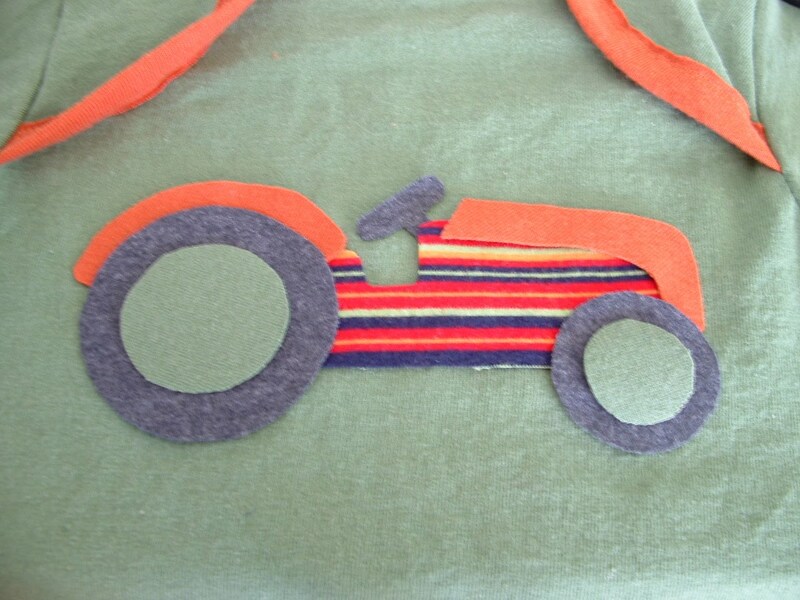 Now you're ready for the fun part...the sewing! 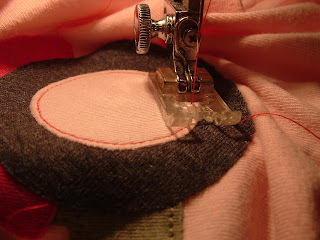 You can use matching thread or contrasting thread. I used a little of each in my tractors. I try to stitch about 1/8 of an inch away from the edge. 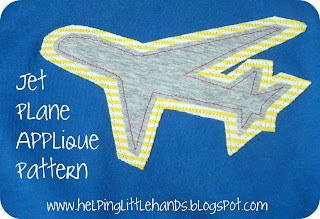 If you stitch too far from the edge, sometimes the edges will roll back a little funny after it's been worn and washed a bunch of times. 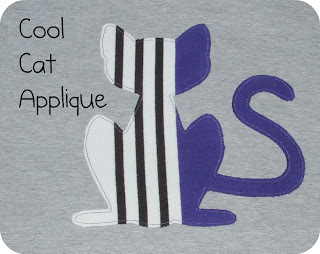 Here's the real secret to really clean looking machine applique...You want to be sure to leave a long tail at the beginning and ends of your stitching and DON'T secure the ends by sewing back and forth. 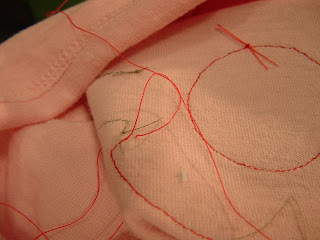 Instead, pull the thread on the front of the shirt, through to the inside. Then tie both threads together in a square knot several times. Then I leave about 1/2 an inch when I cut the threads, so they're less likely to come untied. When I was finished, the back looked like this. Then for a final touch, I sewed on some buttons for the center of the wheels. 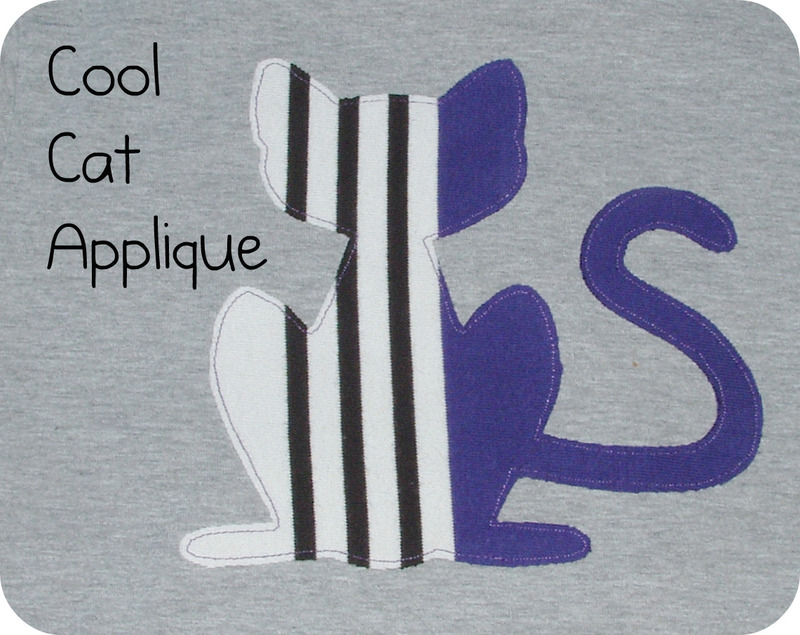 I'll have a pattern up on my blog soon for how I resized my daughter's shirt. (I like to resize slightly larger ones for her so they have more length and we see fewer belly buttons.) 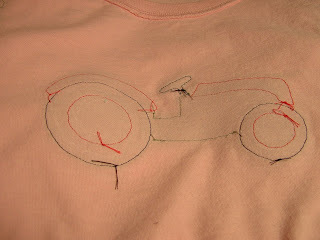 My son's shirt was an early attempt at one of Dana's 90-Minute shirts. The tutorial for the capris my daughter is wearing is here. 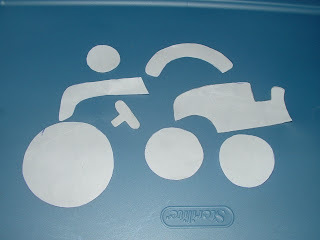 Here's the printable pattern for the tractor. (Pardon the chocolate smudges! 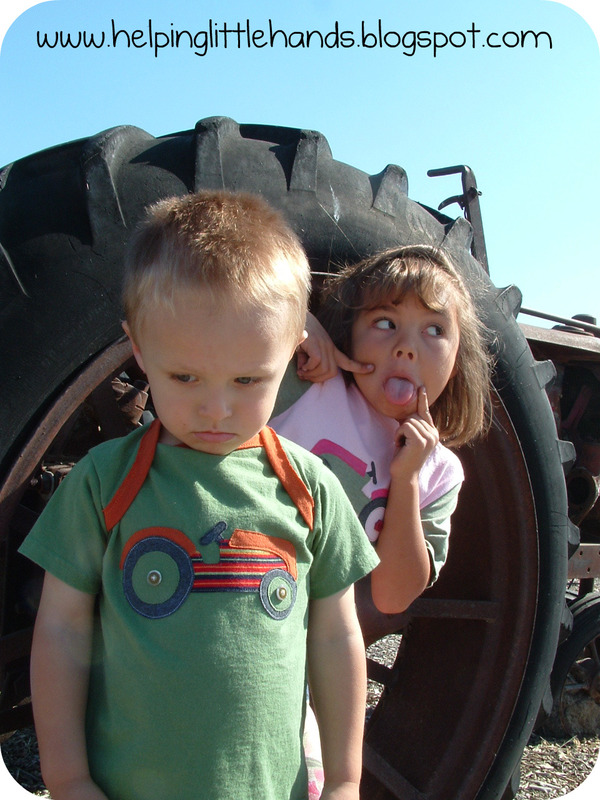 Yikes!) 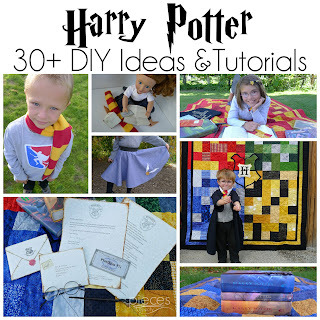 If anyone ends up making one, I'd love to see it! 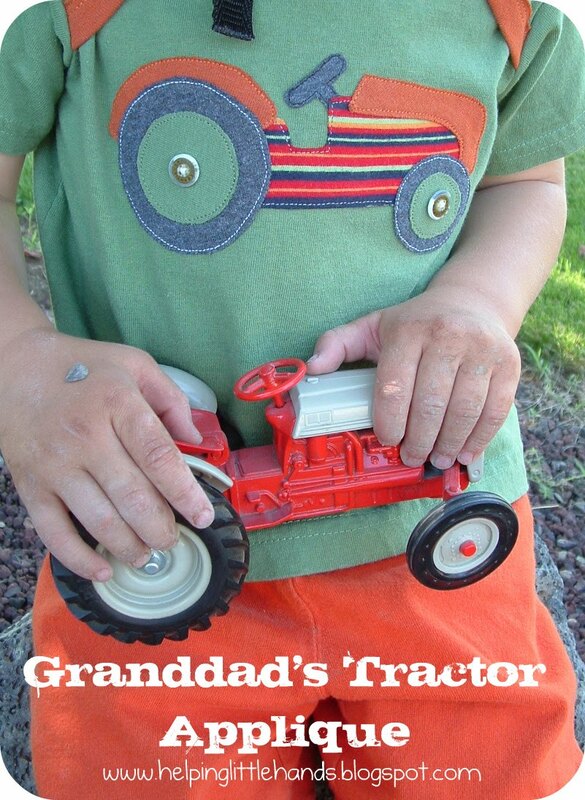 Click here for the Printable Grandad's Tractor Applique Pattern. If tractors aren't your thing, here are a few examples of other applique patterns available on my blog. 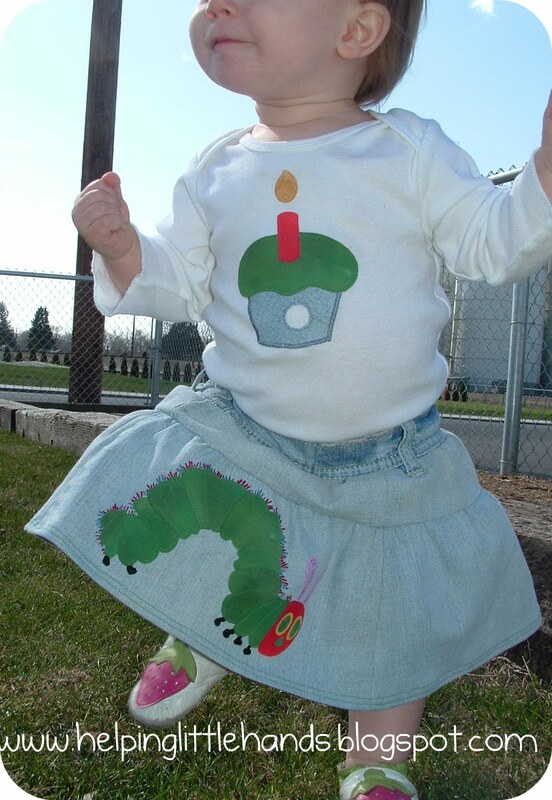 And I'll have a cute butterfly applique pattern on my blog soon. Fun shirt memories! Do the tractor shirts still fit the kids?